The Air Essence empowers you to make tough decisions and is excellent for stress and trauma. It will help you see the overview, while it enhances your inner knowing. The Air Essence was made on top of Schafberg Mountain, St Wolfgang, Austria. 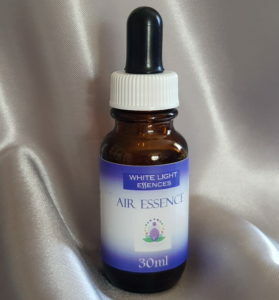 The Air Essence allows a person to journey out to much further realms and levels on the spiritual plane. This Essence has the potential to bring out a person’s spirituality to the highest degree with integrity and passion. It can invoke peace and harmony and let it reign within your heart and mind. It helps you to see life as being simple and to keep it simple, surrendering to God any problem. The Essence itself produces a sensation of feeling light, easy and carefree. It is an excellent remedy for people going through emotional stress and trauma, helping one to see the overview of any problem whilst enhancing one’s guidance and inner knowing in order to deal with the situation more effectively and not get caught up in the detail or the drama. It promotes the realization that life will go on and to simply feel the love and peace around you. Consequently, it greatly helps anyone going through a “black night of the soul” experience by making them aware of the divine guidance and protection that always accompanies one at these times. The White Light Essences work best when taken individually one Essence at a time. The Essences should be taken for a minimum period of two weeks, a standard Essence dose of 7 drops from the dosage bottle, under the tongue, first thing in the morning and last thing at night. These times of the day are powerful periods for the psyche, and at the same time they make it very easy for you to remember to take them. At the end of that period you can either repeat this Essence or commence the next Essence. White Light Essences are very hardy: however there are some precautions that should be taken to keep them at their best.